When you design an opening at home, the customer often has a lot of technical issues associated with installing, joining and installing the window decor elements. The first and most basic question is what material is best used for decorative window decoration from the outside. Our façade products made of foam plastic have proved their practicality, lightness, aesthetics, durability and the most basic – the best price-quality ratio for many years. Therefore, polystyrene foam polystyrene is the best material for decorating windows with decor. 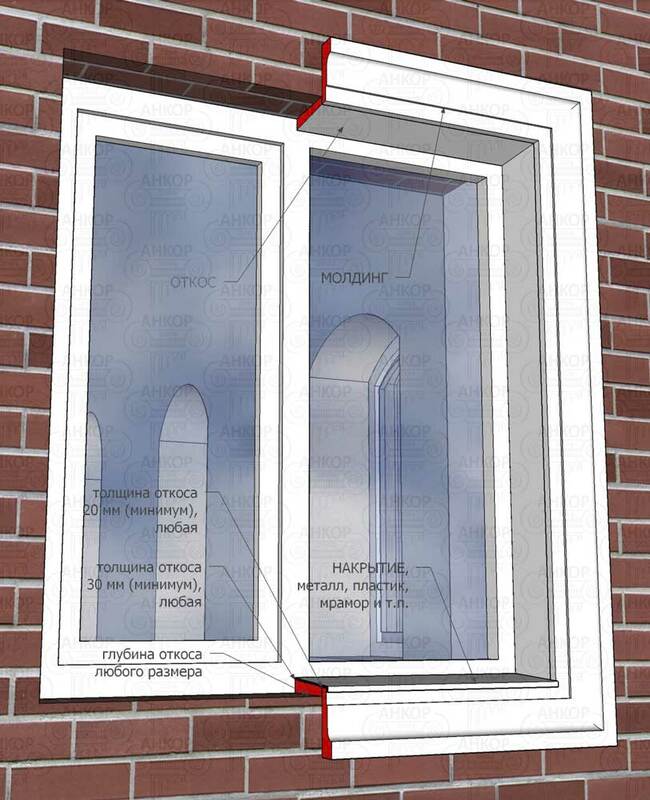 On the examples below, you can also see the significant difference between finishing the windows with your own hands (manually) and manufactured in the production conditions of foam products. Surely you saw a lot of houses with rectangular frames around the windows – this is the simplest and cheapest way to decorate the house opening. But this design of the window does not go to any comparison with our figurative elements of the window decor. The second main question on the decorative finishing of windows is at what stage of insulation is the installation of facade elements. And also if the facade is faced with tiles or in a facing brick. Our architectural elements are light in themselves, so there is no need to leave a mounting place for them without a heater, to produce additional mounting reinforcements, etc. Therefore, the facade decor of foam plastic on the opening of the window is mounted on the rough screed of the insulation until the finish of the walls. If the exterior walls are made of facing bricks or tiles, the decor elements are mounted on top of them. 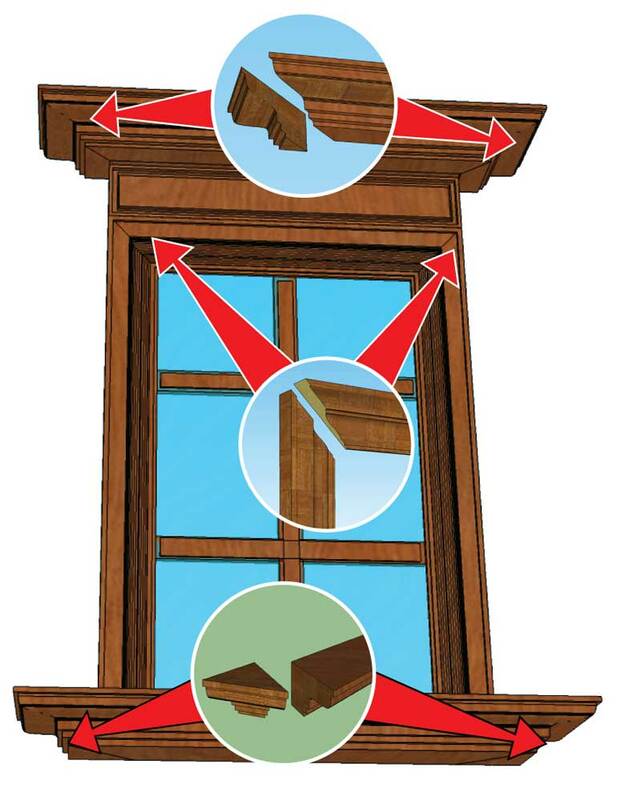 And the third major question when facing the windows is the installation, joints, pruning, slopes. 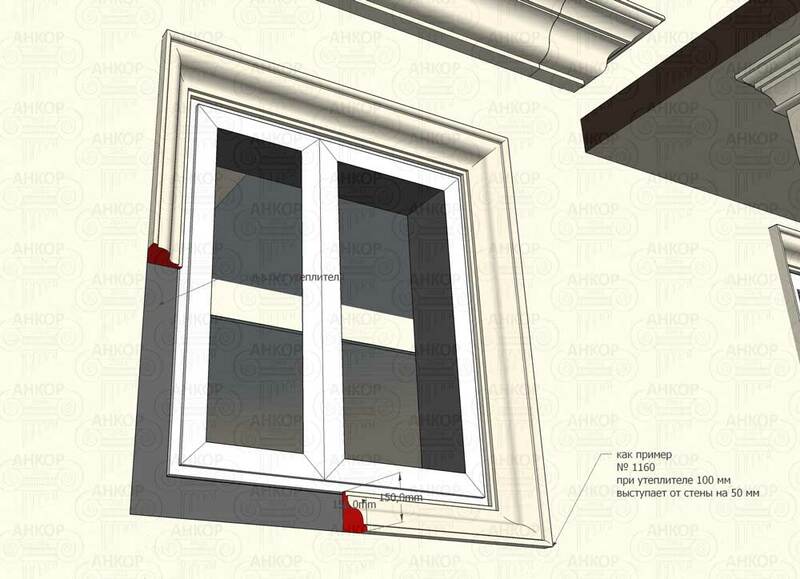 What to do with the oktoos of the window opening on the facade, how does the decor of the window with the slope trim fit together, how is the window and the escarpment mounted together, what glues are used for the installation of the window facade decoration, where to take the scheme of mounting the lock stone on the window facade, how to join the arch window decor with direct elements, when metal is put on the windowsill in the presence of decor, how do the decorative details of the window frame join together? For all these questions, you can get answers on this page of our site. Or by contacting us in any convenient way. The first thing that interests when decorating the facade of a house with a decor is the design of openings. Window and door openings create the main visual image of the facade. The discrepancy between the proportions of the area of ​​windows and the area of ​​the walls always produces a depressing impression. Too narrow or too wide windows easily turn different architectural methods into a work of art. The combination of several windows with a facade decoration of foam plastic into a single composition in accordance with the general concept of exterior decoration of the building’s facade is one of the few ways to decorate window openings. If you need a design of windows from the outside – below on the page you can see a number of ready-made solutions – examples of finishing window openings for which you can easily decide on your own preferences in design. In the figures below, the technical aspects of the matching of the window decor with the escutcheons are displayed. You can see 2 options for decorating the window: molding around the perimeter of the window and a combination of molding and a window sill. The illustrations clearly show that the decorative element is mounted over the end face of the slat. so please pay attention to the ebb – the sill cover – it should cover the sloping part and the decorative element itself. Therefore, if you are planning any architectural elements on the facade – do not rush to order ebbs on the windowsill. They are mounted after the installation of the decor of the facade of the house. The slatted slats can be produced both by installers in the course of insulation, and ordered in the form of finished products from us. We produce slopes of the depth necessary for a particular object. 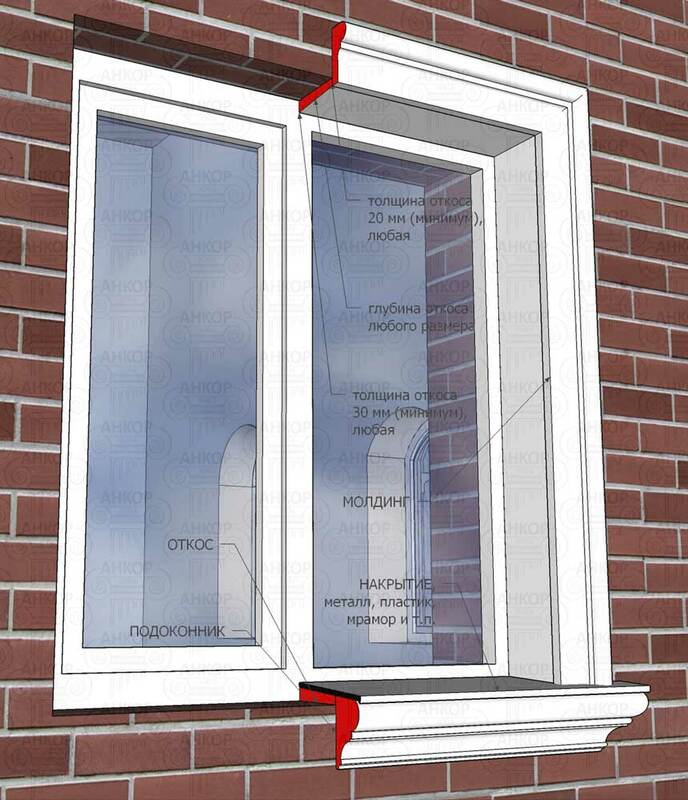 The thickness of the slope is usually 3 cm at the window frame and 2 cm at the wall. Separately, we would like to propose an option for decorating the opening with a decorative element located in the slope. In the photo below we have shown, as an example, the application of profile No. 1160 with section dimensions of 15×15 cm. The decorative cornice is mounted on the wall without a heater, and the insulation does not reach the edge of the slope by the size of the profile (in our example it is 15 cm). Below in the photos of the examples we showed an effective and at the same time practical window decoration on the façade with the solution of the slope issue. The decorative element itself is in this case a slope. Two goals are achieved: a reduction in the cost of finishing the windows when the facade is insulated and a radically different appearance of the window compared to the usual application of molding along the edge of the slope. At such furnish of a window the heater does not reach the edge of the window slope by the distance of the applied decorative element. The reinforcing mesh of the wall insulation is left with the output of 15-20 cm. Then, when installing the decor, the mesh element goes along the front part of the insulation. On the examples below, the entire decorative effect is achieved by the depth of the wall insulation – the architectural decor itself protrudes from the edge of the wall by 3-5 cm. This option of finishing the window slope can be attributed to a more modern style of the facade design at home – to some extent modern. The effect of minimalism is achieved: a minimum of decor – a maximum of visual impression. If you are worried about the filthy protruding parts of the facade decoration, our proposal will also solve this problem. Such a design of the window opening advantageously differs from the usual application of facade molding along the edge of the slope by creating a larger volume and relief with a smaller indentation of the decor from the wall.